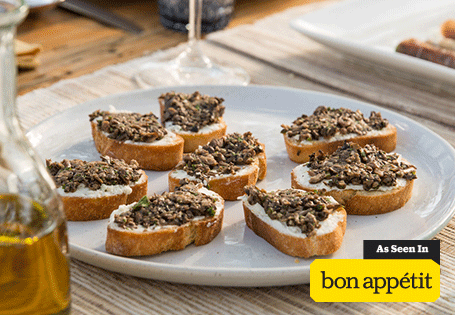 Brush baguette slices on both sides with 2 tablespoons of olive oil and bake for 10 minutes, turning halfway through. Remove from oven and rub one side of each piece with a clove of garlic to impart flavor. In a medium bowl, mix goat cheese with lemon zest, lemon juice, ¼ teaspoon salt and ¼ teaspoon pepper. In a large sauté pan over medium-high heat, heat remaining 3 tablespoons olive oil until it shimmers. Add mushrooms and cook, stirring frequently, until oil is absorbed and mushrooms start to cook down, about 2 minutes. Once pan is dry, add butter, minced garlic, thyme, remaining ½ teaspoon salt and ¼ teaspoon pepper. Continue to cook 2-3 minutes longer, stirring frequently, until mushrooms are shiny and garlic is fragrant. Add white wine and increase heat to high. Cook until mushrooms are browned and liquid is almost all gone. Remove from heat. Transfer mushrooms to a cutting board and finely chop. Add parsley and check seasoning, adding more salt if necessary. Spread each toast with a thin layer of goat cheese (about 1 teaspoon) and top with 1 tablespoon of the mushroom mixture.